Q-talk 103 - Are You Building a Bomb in Your Shop? Aluminum, zirconium, magnesium and titanium have become increasingly common-use metals. It is important that your employees understand some of the special hazards these metals present when being ground or machined. Dust from these metals is combustible and poses a serious fire and explosion hazard. Wet machining or wet grinding processes do not significantly reduce the lizards, and may increase the explosion hazard as the wet sludge dries out. Any process that creates aluminum, zirconium, magnesium, or titanium dust, chips, or turnings should be considered hazardous. This include grinding, cutting, turning, milling, filing, deburring, sanding, buffing, spray painting with aluminum-based paints, and thermal spray coatings, to name just a few. If sufficient cooling flow is not used, improperly designed or dull tools can produce high temperatures at the tool/work piece interface, potentially causing ignition of any "sludge" or metal chips and turnings. Even if an explosion does not occur, a metal fire burns very hot and is difficult to extinguish. Many of today's metal working fluids are water based. Aluminum dust reacts with water in the presence of air to produce hydrogen, which is highly flammable. It is possible for metal dust (from machining or wet dust collectors) to spontaneously ignite if not totally submerged under a cover of water at all times. Many people wonder how much metal dust must actually be present to ignite. The answer is far less than you would imagine. This is dependent on the size of the dust particles. Because these metals are so highly reactive, it does not take much. Aluminum dust combined with iron oxide is used to create thermite. Thermite is used to fill incendiary bombs and burns at 6300? F (3500? C). An individual in Australia was using a belt grinder in his home to smooth the edge of a hacksaw cut on a 2-inch piece of 1.5-inch angle iron He had been grinding less than two minutes when there was a loud 'thump' accompanied by a 2-foot-diameter fireball. Both of his hand and lower arms were severely burned. His face and neck were burned and facial hair was burned off by radiant heat from the fireball. Safety glasses protected his eyes but eyebrows and eyelashes were singed. A few days before, the man's teen-aged son had ground the heads off 12 small aluminum pop rivets on the same belt sander. 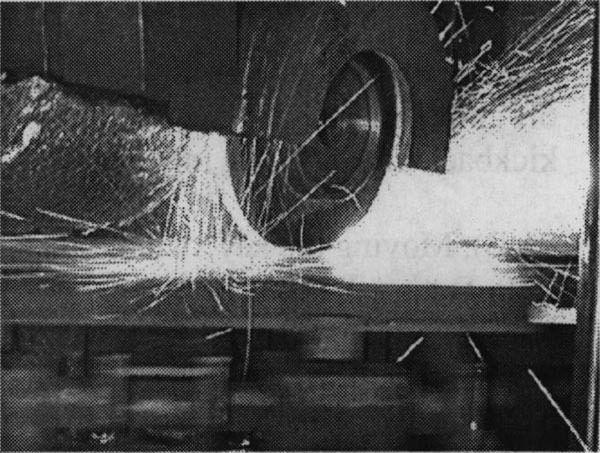 The finely divided aluminum powder from the rivet heads mixed with the finely divided ferrous oxide from the angle iron being sanded down produced thermite that was ignited by the heat from the sanding/grinding process. The following actions were recommended. Aluminum and steel should never be ground, buffed, or polished on the same equipment unless a thorough cleaning of all equipment and associated ventilation and dust collection systems is first completed. A special fire extinguisher rated for metal fires should be available when aluminum, zirconium, magnesium, or titanium are being machined. Never put water on a metal fire?it may cause an explosion! Use a special "metal fire" rated extinguisher or dry clean sand.